I am heading off to Paris on the train tomorrow for work, as all of the major interior furnishing fabrics houses are launching their new Spring/Summer 2012 collections in their showrooms on the left and right banks, as well as at the famous show, Maison & Objet. I’ll be there scouting the latest trends, checking out seasonal color palettes and generally getting inspired! 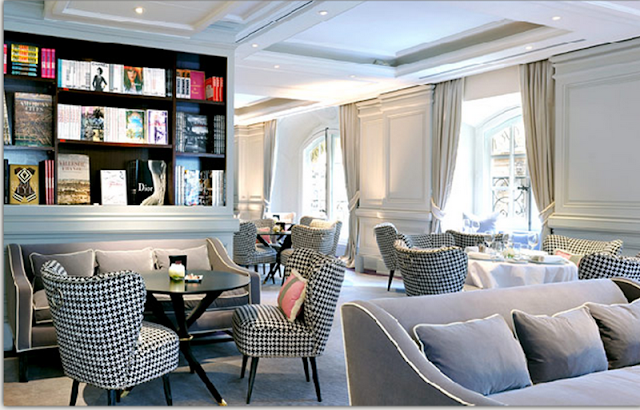 I always stay in the Place Vendôme/rue St. Honore area and one of my favorites is the Hotel de Vendome. This 5 star hotel boasts a fabulous location at 1 Place Vendôme and I just love the interior of the breakfast room with windows overlooking the boutiques on the street below. Rooms and accompanying bathrooms are a good size by Parisian standards, and have all of the amenities you would expect of a luxury hotel. The hotel is not quite on par with the other famous hotels in Paris who share the 5 star rating, but for a smaller, boutique hotel in a perfect location, you can’t go wrong with Hôtel de Vendôme. That hotel looks amazing. If ever I go back to Paris, this is one of the places I'll consider staying in.